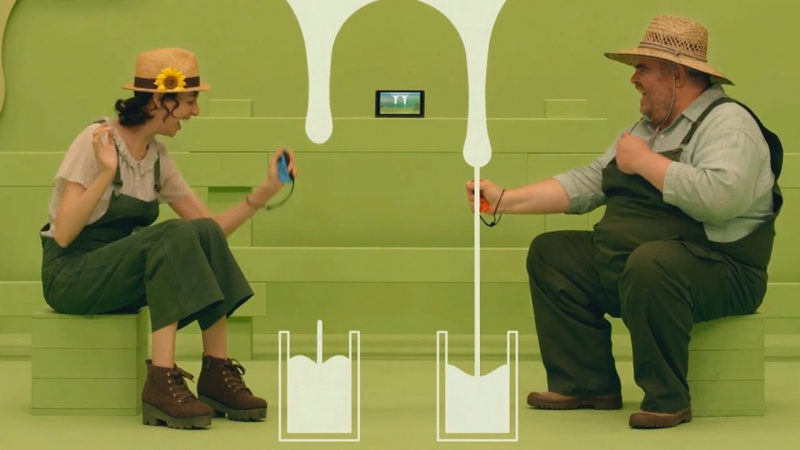 Nintendo cited quirky milking marketing by NOA as generating "additional buzz"
Based upon March sales the Nintendo Switch only had one million+-selling game - The Legend of Zelda: Breath of the Wild. Yet with 2.74 consoles shipped some other titles also clocked up reasonable numbers, something Nintendo President Tatsumi Kimishima highlighted in his recent investor briefing. First of all there's 1-2-Switch, which was the 'other' major first-party retail release in March. It was stated that it's "on track to ship one million units very soon"; this certainly aligns with the sight of the title hanging on in software charts in different territories. Considering the userbase for the console so far, an attach rate of a third or more isn't at all bad. We also have a better idea of why Konami is evidently happy to work on updates, improvements and free DLC for Super Bomberman R; Nintendo's reported that it shipped over 500,000 copies of the game. That doesn't mean they've all been sold on to gamers, but evidently retailers have wanted to have it on their shelves and decent numbers are picking it up. 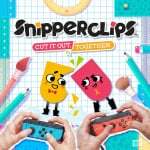 Finally, Snipperclips - Cut it out, together! has been a success story on the eShop; that's unsurprising as it was published by Nintendo. It's been downloaded over 350,000 times, and Nintendo doesn't suggest it's counting demo downloads in that number. There were various other high profile March releases, especially on the eShop, but these numbers do prove that Switch owners were indeed looking for additional games to play beyond Breath of the Wild. I think it's sad that an abomination like 1, 2 Switch can sell nearly 1 million copies while quality games get ignored. I wouldn't even class it as a game, it's a tech demo with a ludicrous €50 pricetag. Glad to hear Snipperclips is doing well. That does deserve its success. Don't underestimate those "Appertizer" games like that. Wanna try 1 2 Switch soon. Impressive numbers for Snipperclips which is by all accounts a small indie game.If it had released multiplatform like any other indie game without all the fanfare of being a Switch exclusive I bet it would have been lucky to sell close to 100k. Having spent some time with 1, 2 Switch, I can confirm it is a trash game and not worthy of anyone's money. It's pathetic compared to Wii Sports, which wasn't even that great anyway. Suprised Bomberman sold well at that awful price. I feel a little sick to my stomach, seeing 1-2-Switch selling close to a million at its current price. Sure, on one hand, I'm glad the game is helping the system sell the most, but for me, I played far better party games in my lifetime. It's like saying "roadkill burger" sells to starving man. Four games to choose from and we are surprised they sold well?! @SLIGEACH_EIRE I think it's sad that you take it personally when people buy a game that appeals to them. Bomberman is a decent game with legs, but Snipperclips is flat-out hilarious fun. My daughter and I spend hours laughing and revenge-snipping eachother while we play. Great game. I don't understand why Nintendo didn't take the opportunity to make 1-2 Switch a pack-in game with the console. That would've been perfect as an extra incentive for the system. Surely it did not cost that much to develop the game? Of course they did the same thing with Nintendo Land, but that was actually a very nice little game. Is anyone surprised nearly a million copies of a tech demo sold at that price? People wanted zelda so bad they bought out the collector's editions and then bought the game once or twice more. There's 3 million switches sold and 4 million copies of BotW sold, do the math. You know damn well Nintendo didn't make a million collector's and master's editions. Bomberman (despite it's annoying difficulty with gems) and 12Switch have been a loy of fun with my wife a couole friends and family. The demo of Snipperclips is great too, but 20 bucks for what I hear only last a few hours after all the other games I've bought....maybe not right now. I enjoy 1, 2 Switch for what it is. Its absurd fun of watching your friends and loved ones look like idiots while you also look like an idiot. Fun for my group though. Couldn't get into Snipperclips, but I am awful at puzzlegames so that's a personal failing. Zelda is one of the most fun and entertaining games of all time. I want Bomberman, but also want it to drop to 30 before I pick it up ala used, My Nintendo sale or Nintendo Select. More games would have probably been sold if they were at reasonable prices. There's a couple of games I want but I'm unwilling to pay the asking price for. Bomberman R and Puyo Puyo Tetris. The most I'd be willing to pay for either is £25. I hope the price for the digital versions get dropped in the future. @PanurgeJr kind of what I was thinking. It's been great with the family. Maybe I just like to try to be a posiitive guy. Not surprised about 1-2 switch because I wanted it from the start but about Bomberman being $49.99 I as surprised all the sales it got. @Galenmereth: Totally agree. As great as BoTW is, it is by no means a casual or multi-player game. My kids and I and friends have had a blast (granted in short doses) with 1, 2 Switch, especially Quick Draw. My son (8 years old) and played Snipperclips for the first time last night. He got so drawn in, we played for over an hour. And that is what Nintendo does better than anyone. 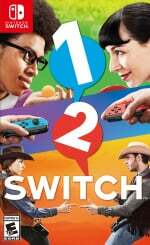 @Mando44646 and Japan is where 1 2 switch sold the best. I LOVED Snipper Clips, but I'm surprised it didn't sell better. Of coarse I have no idea how indie games normally sell and people here are sounding like 350,000 is a great number. I hope they release DLC for it. 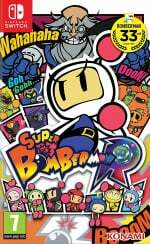 Why all the hate for Bomberman. We bought it and have really enjoyed it. How can anyone be surprised. There wasn't much to choose from. If games like this sell. They should make a sequel. 1 2 3 switch. @Fred13 Fred, you're right on BOTH accounts. @Fred13 it's actually quite good. As I recall it took shovel knight six months to sell 100,000 units between wiiu, 3ds and steam. It was only released in America at the time tho. @craigmoss19 Make an American EShop account. Puyo is only 30 US dollars there. My knowledge of current exchange rates is fairly poor these days but it probably comes close to the 25£ you're looking for. Edit: Thanks internet. It comes out to £23.23. @faint Really it took Shovel Knight that long? I had no clue. The way people talked about that game I just assumed it sold gangbusters immediately. @SLIGEACH_EIRE I agree. 1,2-Switch is not a good game. The system has better things to offer. @Fred13 that is gangbusters for an indie title. @Galenmereth Whatever! It's a pile of stink. @BiasedSonyFan You are 💯 correct. Games like this offset the development costs of things like breath of the wild which took nearly five years to make. @SLIGEACH_EIRE I assume most casuals don't use meta critic. To be fair I haven't played it. Not my type of game. Not sure why anyone would even mix demo download numbers with a full game, unless it's an unlock model. @RedMageLanakyn My understanding is that a lot of people got hyped for Zelda but couldn't manage to find a Switch (at or near launch) and simply bought the game in anticipation of getting the console. I actually know some people that did that. That's at least another million potential sales just based off of only Zelda. Nintendo really needs to get their stock issues fixed. @Sligeach_eire I wouldn't put too much stock into Metacritic user reviews if I were you. A quick look at BotW's user reviews will easily give you the understanding you need (especially since you love the game too). @Ernest_The_Crab Ya, I don't really pay any attention to user reviews. @SLIGEACH_EIRE It's almost like it reflects that the game isn't for everyone. But how could that be? 3rd parties have really missed the boat here. This was the time to shift software. Not surprised. Goes to tell how small loud the fan base can be. Same thing about the ppl complaining abour the prices making it seem like its $90 for a game. Congrats to Nintendo though. Seeing 1,2 switch doing this well only worries me Nintendo Will keep making games like this. Well, the laço of games surely helped. Casuals don't like Bomberman. Konami laughing all the way to the bank. @Shellcore ... and that's the reason why I'm skipping buying a Switch till Black Friday or X-mas. @SLIGEACH_EIRE my kids love it. And their friends. That's not sad.1,2 Switch that is. I know a lot of people have complained about Bomberman's pricing but I can say that, personally, I got it for $40 with my GCU and it's definitely been worth its money. It only seals that deal with the fact that Konami is actually supporting the game, so it'll be worth it even more as it naturally slides down in price. I have over 70 hours clocked so far in the game and can easily see it climbing quite a bit higher over the system's life due to it being a blast(no pun intended) with others; it's a great multiplayer title as expected. I didn't expect 1-2-Switch to sell but I was wrong. Here's something: is it possible that 1-2-Switch has made Nintendo more money than Breath of the Wild after production costs? Scary eh? @beazlen1 my kids and their cousins (8 children in total ranging from 5 to 15) have had many evenings together 1-2-Switch in full on "party" mode. When used in a social context like this, it's a great game. Hours of laughing and having fun. I doubt I'll play it on the train (like Mario Kart 8) and clock in 100 hours - but it was never designed to be that. @bluedogrulez Fake Draw is where it's at! Pff. Ive played 1 2 Switch at parties with non gamers and they loved it. They couldnt put it down! Kids especially loved it. Its all opinion. I think its a hoot. EXACTLY! 1 2 Switch is not aimed at those who give a damn about metacritic scores. It would however be aimed at those who read game reviews on Time Magazine. Ive seen both kids and adults reactions to the game with my own two eyes. Fun & laughter abounded. Never played 1-2 Switch, not interested, but it does tap into that that casual, party game market that the Wii did so well with and Nintendo is not quite willing to let go of. They did market it pretty heavy in the US. Was surprised by Bomberman, but glad to see. All I'll say is if you like the multiplayer, it's worth it. @NewAdvent I'm with you - my only week one purchase apart from Zelda was the Shovel Knight Treasure Trove collection. It's £22 for three fantastic platformers, which is probably the best value we're going to see for a while. Fairly sure 1-2 Switch is going to turn up in discount bins within the year - and that's not knocking its quality, but just a reflection of the fact that the value of those party games lies in their novelty. @SLIGEACH_EIRE What's sad is your devotion to bashing just about everything Switch at every opportunity. This game isn't for you. So what? Obviously lots of other people like it. That makes them sad people? Because they have fun? You don't like it, so it's an abomination? Not everyone is as closed minded as you, so get over yourself. Report me and get me banned for replying to his majesty, I don't care anymore. I have asked this site more than once to enable my ignore of you to also include when people reply to you to no avail, so I don't have to see these comments sections full of people replying to your relentless negativity. Almost 20% of the comments in this article alone are directed at your negativity. It's ridiculous. And Metacritic reviews mean as much as your ramblings. Nothing. Bit of a surprise to see this doing well. I've got 8 Switch games (all but 1 very good) and haven't considered 12 Switch or Bomberman. Goes to show there are still big advantages to having a presence at retail. I picked Snipperclips up as my co-op alternative to 1-2 Switch. Do not regret it. Bomberman R was a nostalgic purchase, but it's great the dev has continued to update and improve performance. @subpopz I literally created this account on here so I wouldn't have to see his negativity, as it was actually driving me away from the site. I too am annoyed that I can still see it when people reply to him. Nice to see our games are doing well and not just breath of the Wild. I was hoping that people on forums wasn't a reflection of people in real life. I got BotW and Voez for my personal play time, Snipperclips to play with my gf, and 1-2 Switch to play with friends and family who are not a gamer like me but want to have fun in a fair way, which is over 80% of the people I know. Even though I still disagree on the pricing with 1-2 Switch, depth and extent the quantity of the games, playing with my little cousins, nephew, and handicapped gaming friends made it worth it; at least more so if I was to play a multiplayer game that I have a clear advantage in. @Galenmereth So you tell Sliggy you enjoy 1-2-Switch and he responds by trying to prove you wrong and that it's a bad game. That sums him up so well. These three games have shipped just under 4.26 million copies. Total Switch software shipments during March were at 5.46 million copies. That means Just Dance 2017, Skylanders Imaginators, and Binding of Isaac shipped a total of just over 1.2 million copies. @Keatsseven I actually usually don't bother reading comments because of that stuff, but sometimes I feel the need to just display a counter opinion when I have it personally. I am sad it means people ignoring those I reply to have it pop up though. Way more people should be playing Snipper Clips! I will say that it's not as fun playing alone, so I guess maybe you could skip it then. 1-2 Switch is fun with a small crowd. It's an act silly and laugh game. Not everyone's thing, but I think more people like that type of gaming than people who want to spend hours and hours in a deep game only for dedicated enthusiasts. Probably WAY more people. In a crowd like the kind that comments on video game internet stories it's not surprising that they prefer the deeper games. I do wish more people would just be fine with how wide a variety of different kinds of enjoyment others get out of gaming. Go look up the 5 domains of play by Jason VandenBerghe if you want a detailed viewpoint on it. When a game doesn't align with what you like to get from video games that doesn't make it a "bad" game, just a bad game for you. You have to consider what other people may hope to get from games to have any sort of well-rounded evaluation of a game. Anywho, 1-2-Switch can be a good time, but I don't think it quite merits its cost even for those that like that sort of game. There's quite a bit of alternative (live action) production going on here, so not sure on costs, and it's hard to estimate how tricky it can be to get some of those motion-based games to "feel" right, but at the price it is, I feel like there should have been more attention paid to customizing the experience (preferred games only in random) and some sort of feeling of progression. Also, launch game publishers know the games will be in higher demand creating a "launch-tax" of sorts making the prices higher for smaller productions. This has been going on for most of the history of console system launches. It's good business but forces consumers to exercise that discipline a bit more. Everyone who is waiting for Switch to become a better value for them is doing exactly the right thing! I've had a ball playing 1, 2 Switch with my 78 year old father. Is he the type of person that is interested in Zelda? Nope! But he gets a kick out of Quick Draw and Ball Count. Snipperclips is another that I've enjoyed with several people. Meanwhile I stick to Zelda, Puyo Puyo Tetris, Snake Pass, and several others for myself. Just got Mario Kart today. All told I have 15 games for the Switch now in less than two months with seven, count 'em seven on my eShop wishlist waiting for a sale. Seven of my collection are physical (I imported I Am Setsuna) and the rest are digital. Anyone who says there are no games for the Switch is bonkers. @Indielink wow, such a price difference. Thanks for the tip. Looks like I'll get it then. Though the price is too much for me still Bomberman R has been sold out everywhere around where I live since about a week after launch. @kobashi100 More like Nintendo's gatekeeping against too many 3rd party titles at once. They expect us all to be playing Zelda until about now - and I JUST beat Ganon a week ago - and now Mario Kart 8 Deluxe comes out. They don't want to barrage players with options paralysis. I think we personally could have had a few more options in the first two months, but it's better than a flood at launch and then a drought the rest of the year. Instead, we get steady releases throughout the year, which is Nintendo learning from the past. @marandahir what has third party releases got to do with Nintendo. Are you suggesting Nintendo are actually holding back on third party releases? Third party publishers decided to hold back after the Wii U debacle and I can't blame them. No doubt some will be now wishing they had titles out for release when they see how well other titles have sold. Actually, Nintendo's the one holding back on Switch 3rd party releases. They're playing very very close with any and all releases, timing them so that they trickle out through the launch year, rather than overloading us with options paralysis, many of which may be shovelware. They're trying to give us a smaller, but more cultivated set of choices. 3rd party support is there for Switch and they're eager to get in; it's Nintendo that's holding close the valves, not the 3rd parties deciding not to come.